Previous PostSix Distinct Genders in Judaism?Next PostWhen is “Winning” in Social Media Going Too Far? 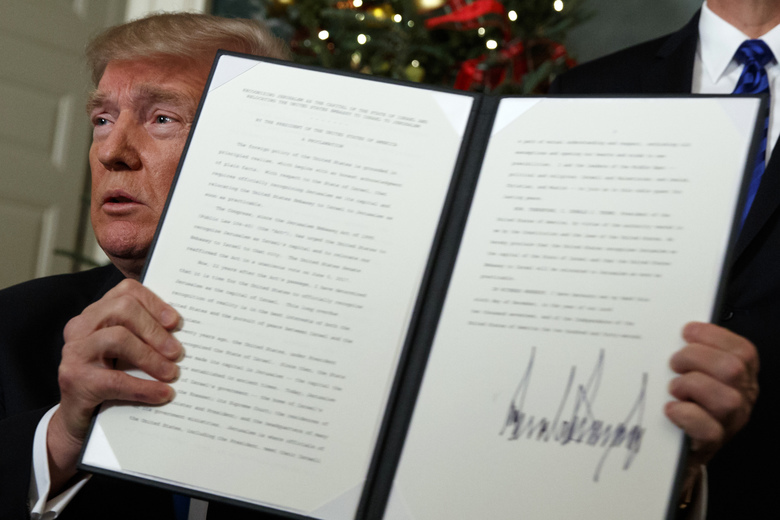 After his remarks, Trump signed another six-month waiver to officially delay such a move — a document presidents have signed since 1995 as part of the Jerusalem Embassy Act. The law technically initiated the process of moving the embassy to Jerusalem, but allowed the commander-in-chief to sign a six-month waiver leaving the embassy in Tel Aviv. A $25 million (at least) supporter of Trump’s campaign for election in 2016 [while his campaign for 2020 is already officially underway, paying his legal fees and much more] was angry when Trump signed the same waver six months ago. June of 2017 The US says its policy on Jerusalem hasn’t changed and that Jerusalem’s status must be negotiated between Israelis and Palestinians. Happy Days to you, James! May your candle light the way in the darkness and bring a ray of hope to the hopeless. Omayne! Shalom! I really, really like this post, James. In the past few years, my pendulum has swung back from hyper love of Christmas to hyper hatred for Christmas (much to the perplexity of my family who endured living with a grinch every year) to a place of peace. I still don’t put up a tree, but I put out ornaments that were special to the family on a little wire display stand, as well as displaying the snowman collection my mom started for me, and since she died, the lovingly hand-crafted Mr. and Mrs. Santa dolls, something I never wanted – until the hands that made them were stilled. This year the snowmen are the only decor as we are going to be out of town for Christmas. It did not seem worthwhile to decorate for just the two of us. But I did suggest to Jim that I would go with him to a carols-sing at church because I know he loves them. And it all started when Amber Michael advised me, many years ago, to go ahead and put up a Christmas tree for my mother who would be visiting, and who loved Christmas. I believe other “messianics” are beginning to think the same way. And let’s face it, when/if the time comes when we need to stand up, stand up for Jesus, “they” won’t care if we sing in Hebrew or English or tongues, if we celebrate Christmas or Sukkoth, if we know the difference between mikvah, mitzvah, and Manischewitz, if we know who Wenceslaus was and why he was good. The only thing they’ll want to know is do we follow the Rav from Nazareth, and we’d better get that part right. Michele On iPhone voice-recognition software; please forgive typos. Hello guys and a Happy New Year to all! Although we have still so many things to tell, regarding the many truth that were still unknown to many people but the truth they were all written intact in the H. Bible. And this is all because of those people were all victim of deception made by their affiliated false religion. Although may be many of these people were all also trying hard to research to know this Sacred God Plan, so they might compare to check it to their faith believe they knew were true or not! But there were problems they did not know, that the KNOWING of these Whole New Covenants of Plan were guarded by a very strict prohibition guildlines, that is impose to the right path to God. And what for also to the very strict order of concealment in the complete knowledge of these God Plan made by Yeshua Messiah in Mt 24:36, because God uses this whole knowledge of this Plan as a Given and Rewarded gift of God to those that Qualified Chosen Call Out Israelites and as also sign or mark to the Father Promise of Salvation, read Rev. 14:1-5.. And unknown to many, the very basic key in the understanding of this Plan is by Knowing the Subtitles of these Plan were all in the Covenants term, with a simple meaning that it can not be applied to other class of people, unless the Transition comes of the Parousia Covenant, which is already our present period!! And what if we also check the true teachings of the gospel, from the questionable nativity unto the questionable cruxifiction, which most of the world religion took the writings Literally and even taught it in a true to life story, not knowing the main character parents have no true to life records, making the geneology writings of the gospel contradict to one another, making it a false teaching! When the truth of this nativity was prophesies in O. T. is in the parable. And when it was fulfill, it was also written in the parable fictionize story which the Evangelist adapted it to the morphology and physiological formula of God, which was used in the creation of Adam. And about the cruxifiction, this was also written in the figurative writings that only teaches the reader to also nail the Christ in their golgotta or brain or in other word “they were only advise to Memorize the Word of God and will have eternal life!” So, there is no idolatry but only full allegiance to Yeshua M.! And what for of this fact, that the Word is God. Why when God was send to save his people, the world religion presented him as a child boy (sto. nino) and a cruxified man? When it is very clearly written in the H. Bible in Numbers 23:19 ” God is not a man, ff.” Mal. 3:6 “God have not change, ff.” 1Sam. 15:29 “he is not a man, ff.” Heb. 13:8 “he is the same yesterday and today and forever.” Is this not A. Paul also proving that God did not change? And with these, they did not really know or understand the Plan of God, to change God into a man. And the gravest and most controversial problem now of all these religion were the already applied and executed Universal Final Judgment to all the gentile nation in Mt. 25:31-41 by Yeshua M. ever since 1st Century. And this was also justifed concluded in the Parousia Plan of the end time revelation of A. Paul in 1Tes. 4:16-17, that there were only two class of group of people that will be caught by the clouds and be brought to heaven and meet the Lord there. And NONE of any religion were caught by the clouds. Now, with all these problem of contradiction to these very Spiritual Covenants Plan of God, if this Plan were not fully written in the N.T. gospel book they might be exempted. But how come that they did not understand them? When the truth, that they all claim they have read and believe to Yeshua Messiah?? ?